An Autoimmune Arthritic Systemic Life©: "Giving Tuesday November 27th 2018" STOMP OUT BULLYING!!!! The "Global Movement"
"Giving Tuesday November 27th 2018" STOMP OUT BULLYING!!!! The "Global Movement"
Giving Tuesday, the Tuesday after Thanksgiving, is a movement to create an international day of giving at the beginning of the Christmas and holiday season. On this day of GIVING, we ask you to think of the youths who we work to keep safe at school every day .. the youths who we work to keep safe online... the youth whose lives we save every day. World Kindness Week is November 13 - 20th. 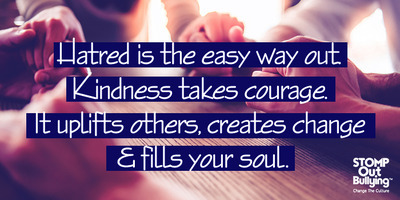 The purpose of World Kindness Week is to highlight good deeds in the community, focusing on the positive power and the common thread of kindness that binds us. Today and every day, focus on the good and spread kindness wherever you go. One way you can do this is to stand up for people who don't have a strong voice. You can also use inclusion, unity, respect and acceptance to spread kindess to the people around you. YOU can make a huge difference. At STOMP Out Bullying™, we LOVE to share messages and stories of kindness, and to hear yours. What are your plans for this World Kindness Week? Share your thoughts with us on social media and let’s keep the global conversation on kindness going.